There’s a topical cream you can apply about 45-60 minutes before dialysis that may numb the area. It’s called EMLA and it’s Lidocaine or Prilocaine at 2.5% concentration. You can get it at a drug store and it requires a prescription. “I have the Lidocaine+Prilocaine cream, but it works the same as the EMLA cream. It soaks in over the hour or two that you have it on and covered. When you get to dialysis, you take off the plastic/dressing and wash off the cream. It stays numb for another hour after that. I feel no pain at all with the lower needle. The upper needle can hurt a bit as it goes further in. When you start dialysis the prospect of a 15, 16 or 17 gauge needle being rammed into your arm is daunting… to say the least. It was for me, too. The techs referred to the sizes as “small, medium and large”. That really doesn’t describe them well. To my mind, they were all HUGE and, maybe, HUGER and HUGEST. I described them to my friends as being about the size of the end of a ball-point pen. The listener would squirm at the thought. I knew at that point, they understood. The logical solution to getting poked with that huge device is to inject Lidocaine before the stick. For me it seemed a better alternative and so I requested it and the tech did it. After a year or so, my very special tech, Krystal, began telling me that I shouldn’t use Lido as it causes scarring. I struggled with this question for a while and then let her do one stick without it. Given the sting of the Lido or the pain of the large gauge needle, it was actually less with the dialysis needle. After a while, there is no pain at all as the area deadened to the poke. …lidocaine works great however the medical community is split some say it’s bad for the graft some say the benefits outweigh the risk. I personally never wanted to take that chance and when I had a graft I never used Lido. And also I have never used it with my fistula. I would say the best thing for you to do is take the pain now and get the area nice and dead. The area where you stick the needles will deaden and you will eventually have very little if any pain at all. I have seen patients ALWAYS use lido and their graft is fine, so it is up to you. Or you can just use lido for a little while, say the first few months and slowly wing yourself off of it. He has some very good advice and the scarring issue Krystal raised is important. Since I was on Lido for a couple years, I have to deal with that. I have a large area that is scarred from repeated Lido injections. The result is that it doesn’t heal as easily after the poke and sometimes it won’t clot as quickly so I have to be careful to give it sufficient time to clot and heal before I remove the bandages. If I hadn’t stopped using Lido, it would be much worse. There’s a topical anesthetic cream that you can apply an hour before being stuck and that seems to help in the first few months as you ease into the adventures of being stuck. You just have to remember to apply it ahead of time and wrap the site in plastic. Easier said than done if the site is not on your lower arm! If you’re new and the stick site can be accessed easily, give it a try as you transition from Lido. It may help. The trick seems to be getting a tech that is really good at sticking you. That’s not always easy. I once asked another tech to let Krystal stick me and she got offended and walked off in a huff. We didn’t speak for several weeks until I stopped her, apologized, and explained that I was going through a difficult sticking time and asked her not to take it personally. We made up and were “friends” again. But, it’s something I go through every time I have to break in a new tech. For example, last week I was on a different shift. My regular tech wasn’t there so I had a new tech. The first time, no problem. The next time, BIG problems. Infiltration and bruising and tenderness. The next time, digging and hunting and calling on the charge nurse to help. OW! I’m glad I’ll be back on my regular shift this next week. But, suffice to say, no Lido. I endured. I learned that lesson, too. Previously, I would let the tech dig around and keep trying to find the artery or vein they so eagerly sought. Now, I give them about 5 minutes and tell them, “Remove it! Wait ten minutes and try again.” I need that time to recover. (Also, ask for Tylenol. It helps.) Rest up while they are getting the meds and a new needle. In my case, there’s a spot where the vein narrows (or so we think) which makes that area particularly difficult to stick. When a bad stick happens, I tell them to go back to proven ground and stick there. We’ll explore new “terror-tory” later. But long story short, no Lidocaine, no matter how much the needle stick hurts, it’s still less than the sting of the alcohol suspension of Lidocaine and there’s never enough Lido to make all the pain go away. If you’re using Lido, I encourage you to stop. Discuss it with your doc or an experienced tech and see what they have to say. If you have some sage advice, please leave a comment. Dialysis is new to many people and sharing your experience helps! This entry was posted in dialysis, lidocaine, ointment, pain, prilocaine and tagged dialysis, ESRD, hemodialysis, Lidocaine, pain, treatment. Bookmark the permalink. I did heamo for 9 months and I never used my fistula. I only used my permcath which was inserted into my chest. I still have my fistula, I need to have it removed at some point. But I used to watch the other patients get their needles sticks and thought there was no way I would do that. 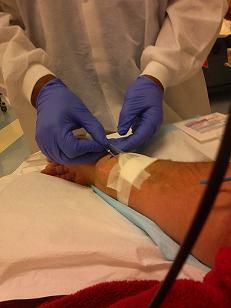 Luckily with peritineal dialysis I don’t need any needle sticks. They use Lidocaine on me when I am in the hospital. In my clinic, they use Pain Ease. it is a spray which freezes the skin. I am not sure if it is harmful to my fistula, but, it sure makes the insertion of GIANT needles easier on me!! I’m sure the spray doesn’t have the drawbacks of Lido injection. I found these warnings about it from the manufacturer.It shouldn’t effect the fistula. But it could damage the skin and isn’t good if you have poor circulation. And, watch for infection. of needle insertion procedures such as starting IV’s and venipuncture. application, but lasts less than one minute. It should only be applied to intact skin. I start next month and am trying to come to terms with it I HATE NEEDLES so I had the catheter installed also Im 60 years old and diabetic this is a wonderful site for me its all about staying alive and feeling well! will let you know in a couple of months on the info is true and what is not! Best of Luck on that, Rick! Keep up that good attitude! Let us know how it goes and if there’s something we can do to help via the blog site. I use AMLA cream. Just never liked the feel of the 14 gauge needles poking the skin. You all are so brave and I admire your strength. Dialysis it not easy, just sitting in the chair for 4 hours is enough. I watch my patient do it every day. I often imagine how I would handle doing this every other day. I hate getting needles let alone 15 or 14 Gauge. I pray for your continued strength daily. I am looking for some infromation to give to one of my patients about the harmful effect of injectable lidocaine on your access. I do see that there is some guidence given above but I was looking for something more formal. Can you please assist. Thank You and Thank you for allowing me to serve you. The ice spray seems to be the best but you may have to supply your own if the facility doesn’t offer. Talk with your nurse and tech. I use the Emla cream, put a strip down the access and cover with tegaderm (plastic wrap will do) do not rub in leave the white strip there it numbs the site no mater if they change where they are going to stick I am covered.I am on the large needles now the emla cream is a life saver it numbs the area and you do not feel the needles going in at all. There is a cream that people use before they get a tattoo. I wonder if would be same, better or worse for the area. I don’t know the name of any product. Your thoughts please. Any of you have buttonholes?